The 19th Century Was An Interesting Time! The 1800s were surely nothing like the 2000s that we live in today! In fact, if we had to choose between living in the 19th Century vs. living in the present, we’d choose the latter. But why? Well, it’s quite simple. We’ve truly come such a long way in terms of medical research, technological advancements and achievements, and our overall understanding of the human body. This substantial progress has allowed us to provide such a high standard of health care today (namely dental health care), but we wouldn’t have gotten to this place if we didn’t experience a few stumbles along the way! 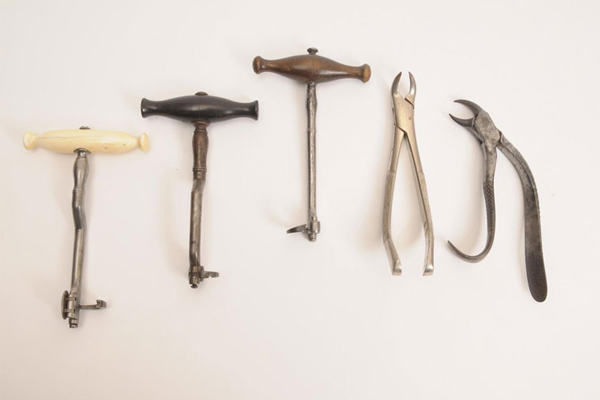 So, what exactly was dentistry like in the 1800s? We’ll tell you! First off, teeth were extracted with a turnkey. Ouch! Can you imagine the sensation? Today, our Milton dentist removes teeth with extraction forceps and elevators and teeth are (thankfully) numbed up first with a local anesthetic. Tooth decay was removed with handheld instruments, and fillings were made from lead, silver, tin and gold foil. We’re very lucky to have such strong, effective and safe restorative materials today – including the option of tooth coloured (composite) fillings that blend in seamlessly. The introduction of composite fillings actually came in the 1900s. Ether and nitrous oxide (laughing gas) were used as anesthesia. That’s right – in order to eliminate pain during invasive procedures, dentists would soak a towel in ether and place it over their patient’s face, or would administer nitrous oxide gas. Thank goodness we have many more reliable sedative options available to choose from today! ...and these are just a FEW of the ways dentistry was very different from today. The 21st century is a great time to be alive… especially for our smiles! With modern dentistry, we have access to so many advanced techniques and tools that help dental professionals to treat patients successfully and safely. Our dentist in Milton uses the best in dental technology to give patients the optimal results they so deserve. In need of some quality, 21st century dental care? Call Southview Dental today! In Need of Dental Care in Milton? At Southview Dental, we understand how much of an impact your oral health has on your entire body. Your smile should be healthy, functional, and one you're proud to show off! That’s why our dental team offers a wide variety of quality dental treatments to patients of all ages. So whatever your unique dental needs are for your one-of-a-kind smile, we’ve got you covered. Has it been over six months since you’ve last had a professional look after your smile? Our Milton dentist and team would love to see you for a check-up and cleaning! Contact us today to book an appointment.